Dr. Abraham Acosta is Associate Professor of Latin American Cultural Studies in the Department of Spanish and Portuguese. He came to the University of Arizona from the University of Michigan where he received a Ph.D. in Comparative Literature (2007). Prof. Acosta's areas of interest include contemporary Latin American narrative, critical hybridity, political narratology, subaltern studies, postcolonial theory, and critical theory. 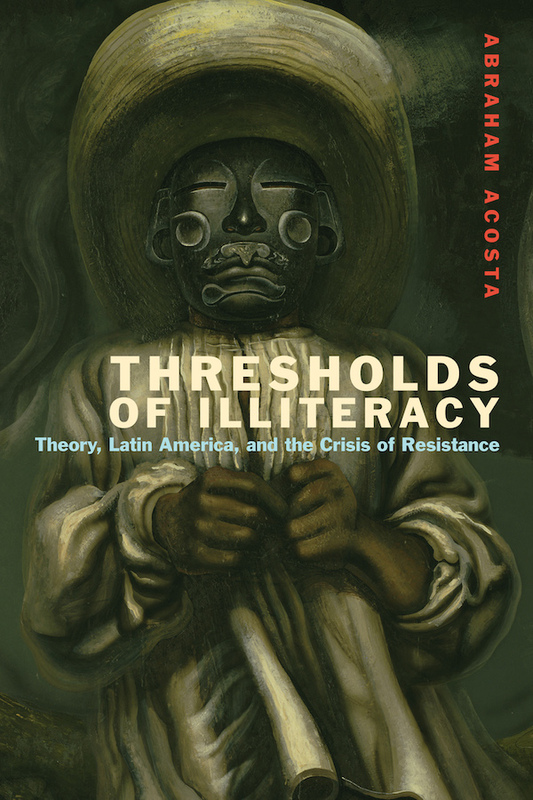 His book, Thresholds of Illiteracy: Theory, Latin America, and the Crisis of Resistance, is published by Fordham University Press. 2018. “Crisis and Migration in Posthegemonic Times: Primitive Accumulation and Labor in La Bestia.” Dialectical Imaginaries: Materialist Approaches to U.S. Latino/a Literature in the Age of Neoliberalism.Marcial Gonzalez and Carlos Gallego editors. University of Michigan Press. Pages 241-262. 2018. “The Posthegemonic Turn.” New Approaches to Latin American Studies: Culture and Power. Juan Poblete, editor. New York; London: Routledge. Pages 255-271. 2016. "Illiteracy in Latin America." The Encyclopedia of Postcolonial Studies. Ray, Sangeeta, Henry Schwarz, José Luis Villacañas Berlanga, Alberto Moreiras and April Shemak (eds). Blackwell Publishing. 2013. “Sign-Cutting: Thresholds, Borders, and Others in the Devil’s Highway”. The Shade of the Saguaro/La sombra del saguaro. Gaetano Prampolini and Annamaria Pinazzi (eds). Firenze: Firenze University Press. 2018. Introduction to Special Issue, "Unsettling Coloniality: Readings and Interrogations". Edited by Abraham Acosta. Journal of Commonwealth and Postscolonial Studies. 6.1: 3-16. 2011. “Legras, Horacio. Literature and Subjection: The Economy of Writing and Marginality in Latin America”. Studies in 20th and 21st Century Literature 35 (1): 166-168. Introduction to Spanish-American literature from the colonial to the contemporary period. This course is designed to explore theoretical/critical readings in order to discuss key issues involving Spanish American literatures and cultures contemplated. Throughout the course we will examine an array of perspectives as modes of understanding the creative texts. In the light of the readings students will develop original research projects.